I can’t believe that I completely forgot about Monday Treat Day last week. Will you ever forgive me? 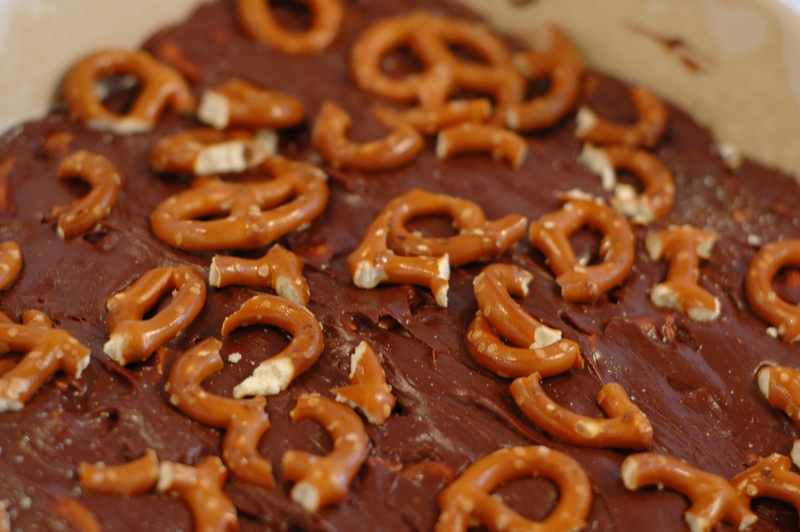 My mind has just been somewhere else… hard to believe, I know, when there are things like pretzel fudge to be made. But don’t worry, this bad boy is worth the wait. I’ve never been a huge fan of fudge. Too much of the time it’s overly sweet and grainy. So most of the time, I’d rather just have a good old piece of chocolate. But then I was leafing through one of those little Everyday Food magazines that I get in the mail, and always mark recipes in, but never seem to use, and this little gem was on the very last page. Feeling ambitious, I decided I had to make this RIGHT NOW. I even left the house again to go to the store and get pretzels… don’t laugh, after getting home from a long day of work, this is kind of a big deal. Of course, by the time I got back from the store with the bag of pretzels, the last thing I wanted to do was make fudge. But I soldiered through and I’m very glad I did. 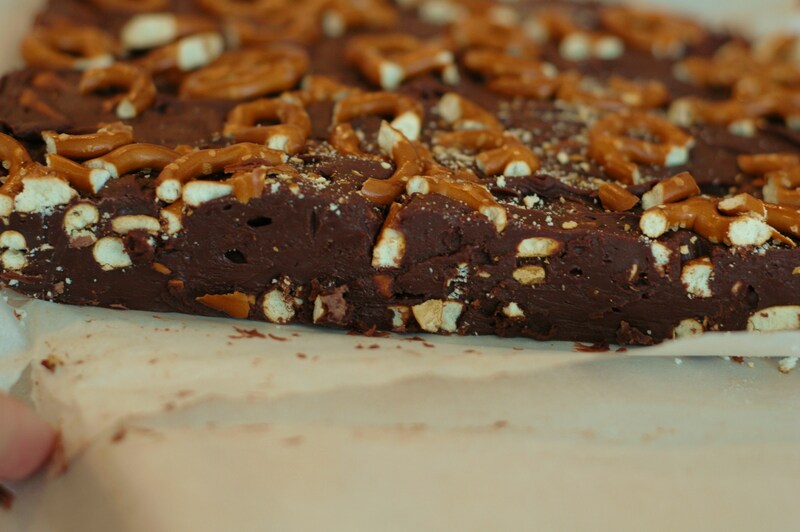 Because now I have this Pretzel fudge in the house. 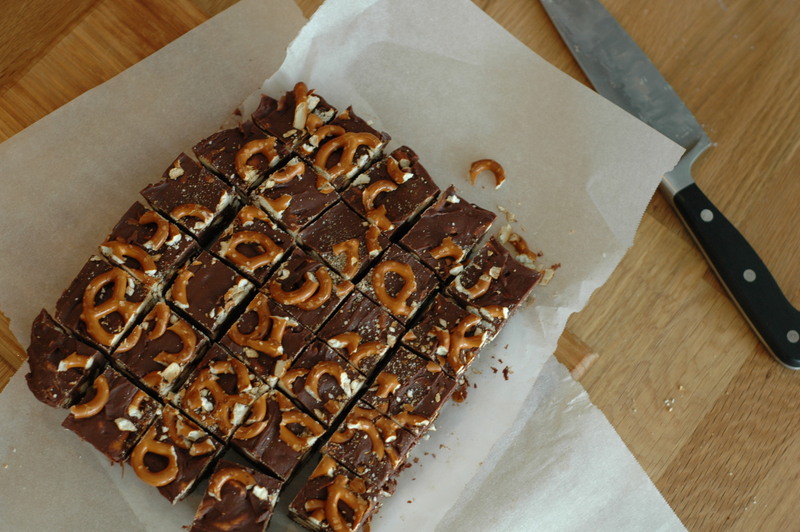 I don’t think I really have to tell you what this tastes like… it’s fudge with pretzels in it. But the fudge itself it actually really delicious- sweet, but not too sweet, and not at all grainy. The pretzels add that salty-crunchy thing that I go ga-ga over. Your basic dream-come-true. Coat and 8 inch square baking pan with cooking spray and line with 2 sheets of parchment paper, leaving a little bit of an over hang on each side. 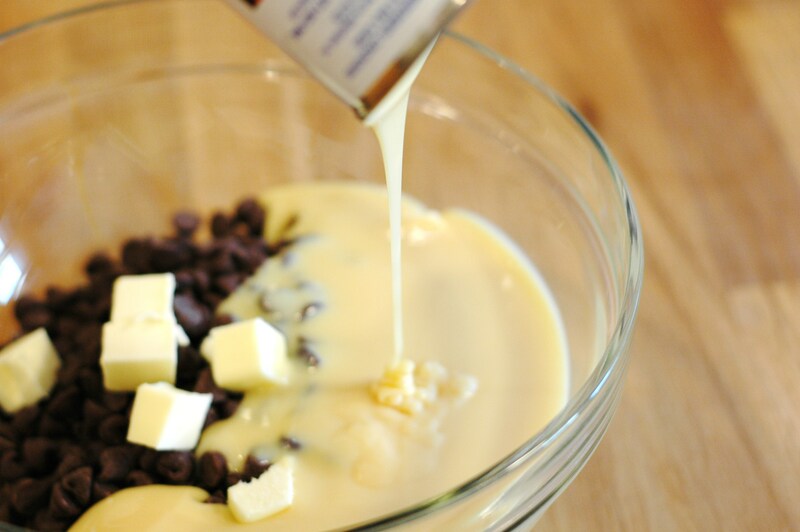 Place the butter, chocolate chips, condensed milk, vanilla, and salt in a medium heatproof bowl set over a pot of barely simmering water. (Hint: the water should NOT be touching the bottom of the bowl.) 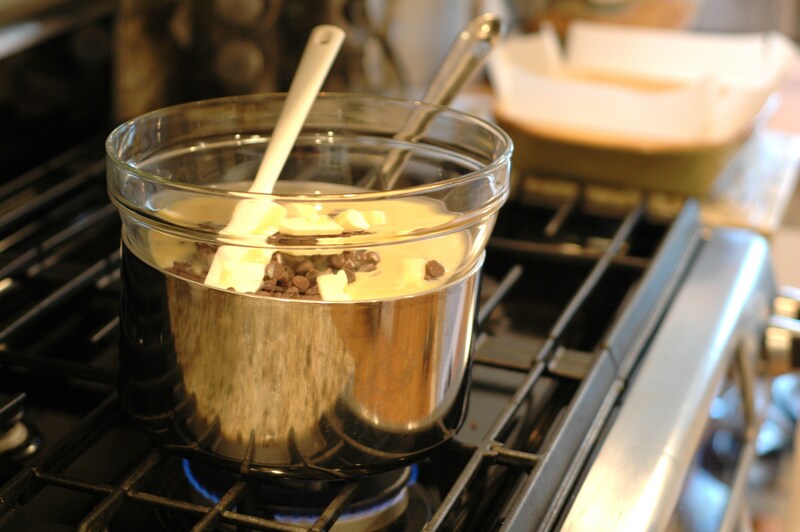 Stir occasionally until chocolate just melts and mixture is combined and warm but not hot, about 8-10 minutes. 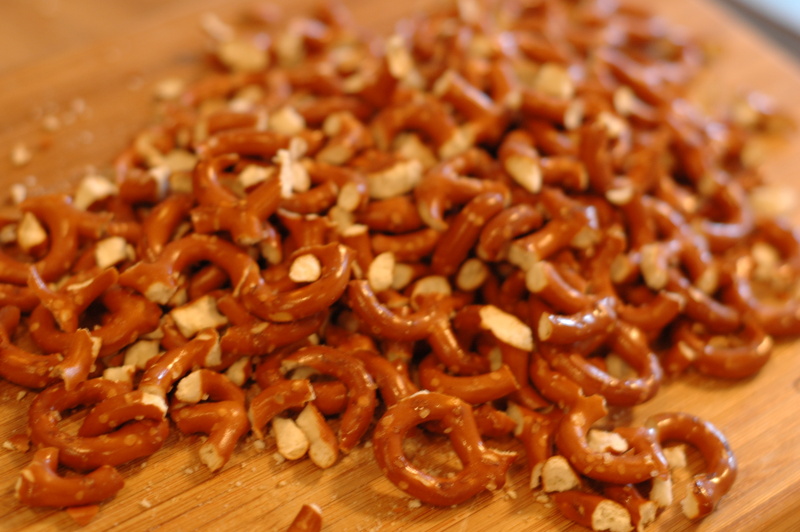 Remove from heat and stir in 2 cups of the chopped pretzels. Transfer mixture to pan and smooth the top. Press the remaining 1/2 cup pretzels on top. Refrigerate until set, 2 hours or overnight. Using the parchment, lift fudge from pan and cut into 36 squares. So glad you posted this! I got it in my copy of Everyday Food but I guess I didn’t pull this recipe out before I tossed the issue. I’m making this right now and taking it on our trip this weekend! Thank you! Awesome- this will be the perfect holiday weekend food! Hope you enjoy it! I made this for “the boys” but had more than my fair share. 🙂 This was really delicious.